Plants need the right combination of nutrients to live, grow and reproduce. When plants suffer from malnutrition, they show symptoms of being unhealthy. Too little or too much of any one nutrient can cause problems. Plant nutrients fall into 2 categories: macronutrients and micronutrients. Macronutrients are those elements that are needed in relatively large amounts. They include nitrogen, potassium, sulfur, calcium, magnesium and phosphorus. Micronutrients are those elements that plants need in small amounts (sometimes trace amounts), like iron, boron, manganese, zinc, copper, chlorine and molybdenum. Both macro- and micronutrients are naturally obtained by the roots from the soil. Plant roots require certain conditions to obtain these nutrients from the soil. First, the soil must be sufficiently moist to allow the roots to take up and transport the nutrients. 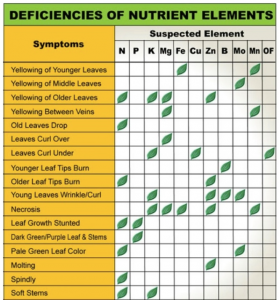 Sometimes correcting improper watering strategies will eliminate nutrient deficiency symptoms. Second, the pH of the soil must be within a certain range for nutrients to be release-able from the soil particles. Third, the temperature of the soil must fall within a certain range for nutrient uptake to occur. The optimum range of temperature, pH and moisture is different for different species of plants. Thus, nutrients may be physically present in the soil, but not available to plants. 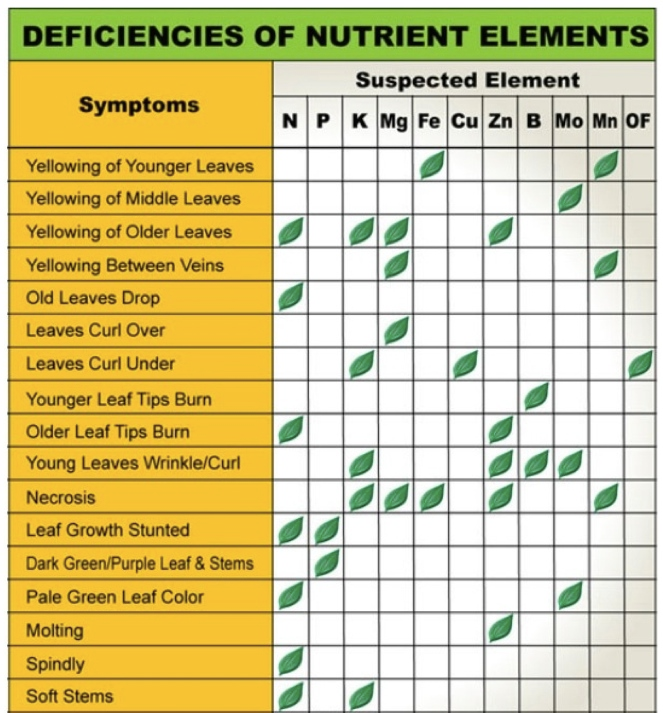 A knowledge of soil pH, texture, and history can be very useful for predicting what nutrients may become deficient. This entry was posted in Fruit, NutrientCycling, Permaculture, SoilCare, Vegie Patch. Bookmark the permalink.